EurekaLog is injected in your application to work. This includes EurekaLog's code and EurekaLog's data. Both are equally needed for EurekaLog to work. • EurekaLog's code is usual Delphi/C++ Builder units, which consists of .pas/.dcu files. Code contains EurekaLog's logic. Most important part of which is exception hooking code. You include EurekaLog code by including EurekaLog's unit into your project (uses clause). Usually this is done automatically when you enable EurekaLog for your project via "Project" / "EurekaLog project options" menu item. • EurekaLog's data consists of EurekaLog's options for your application and debug information. 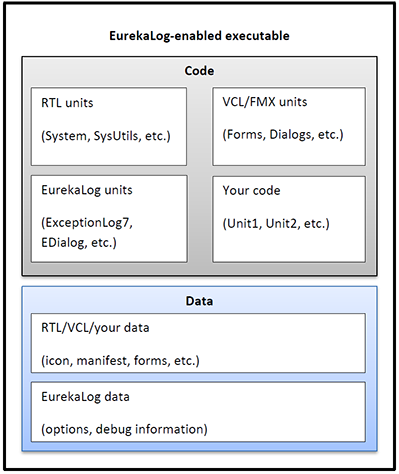 Options are needed to properly setup and configure EurekaLog's behavior on startup. Debug information is needed to build human-readable call stacks in bug reports. 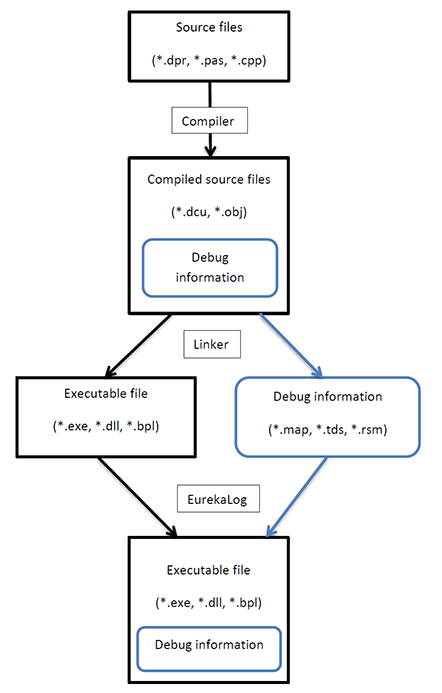 EurekaLog's data is injected by post-processing compiled executable with EurekaLog (either by IDE expert or by command-line compiler). Usually this is done automatically when you enable EurekaLog for your project via "Project" / "EurekaLog project options" menu item. You can see EurekaLog code+data. For more information about compiling your application with EurekaLog see these articles.